My elder sister just returned from her Italy holiday last week. 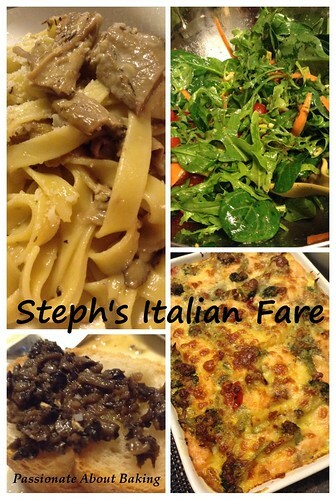 She was very kind to host an Italian dinner for us last evening. She shared with us her truffles and porcinis. It was a wonderful family dinner! 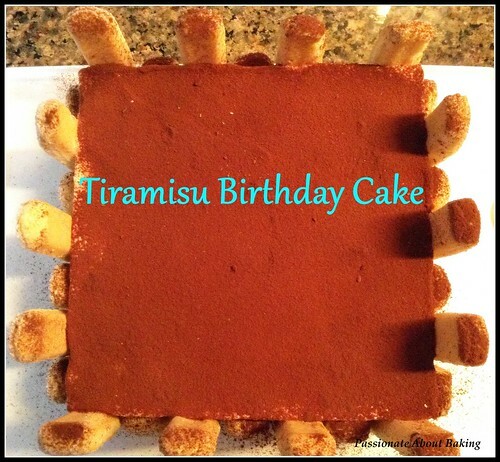 To complement her Italian fare, I made a Tiramisu cake, also to celebrate my spouse's birthday. I remembered Annie had a tested and proven recipe on her blog, so I used her recipe. It was so good that everyone had seconds after that heavy dinner!! Even my mum who doesn't like coffees, had second piece. Ok, I shan't say more, you know how good it is now. This is definitely a keeper for me! 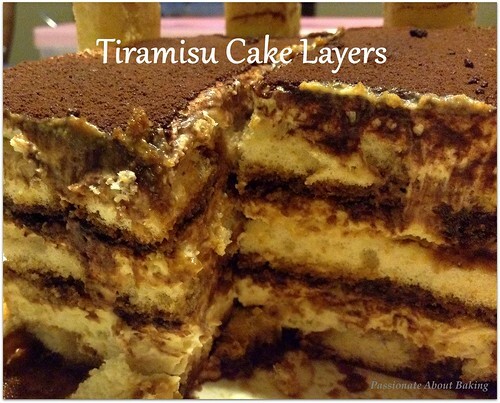 Recipe for Tiramisu, adapted from Annielicious. 2. Pour coffee mixture into a dish. Dish length must be longer than the Sponge finger. 3. Whisk cold whipping cream till stiff. Once done, put the cream back to the fridge. 4. Separate egg whites and egg yolks. Beat egg yolk till pale color. 5. In another clean and dry mixing bowl, beat the egg whites till stiff peak. 6. Add mascarpone cheese into a mixing bowl, add egg yolk and mix well. 7. Add in whipping cream, egg whites and 3 tsp kahlua into the mascarpone mixture. Mix until everything is incorporated. Put the whole bowl of mixture back to the fridge for later use. 8. Prepare a 8" square mousse cake ring. 1st Layer – Dip sponge fingers (Sugary side) into the coffee mixture. Do not wet the sponge finger too much. Just dip in, count 1, 2, 3. And you will have to take the sponge finger away. Cut the sponge fingers to fit onto the cake tin (if required). Put dipped sponge fingers into the cake tin, sugary side up. 2nd Layer - Spread the creamy mixture on top of the sponge fingers. Sift some cocoa powder on top. 3rd Layer – Repeat step 1. Dip sponge fingers into the coffee mixture (non-Sugary Side this time). 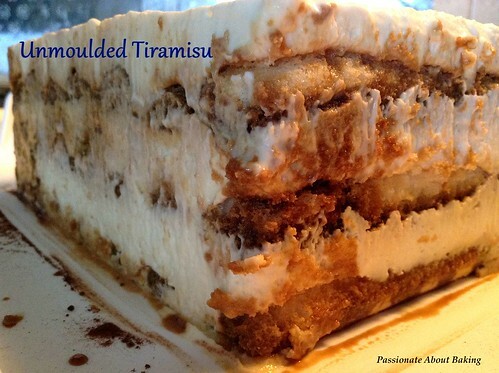 Put another layer of sponge fingers on top of the cream. 4th Layer - Spread the creamy mixture on top. Again, sift some cocoa powder on top. 5th Layer - Dip whole sponge fingers into the coffee mixture. (I wanted to use up the coffee mixture, so I dipped the whole sponge fingers into the coffee mixture). 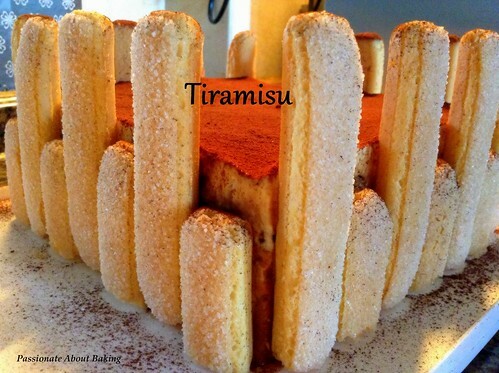 6th Layer - Cover the sponge fingers with the remaining creamy mixture. Place the cake ring on a cake container and keep it into the fridge for at least 8 hours. I kept mine overnight. 1. Using a spatula, loose the sides of the cake ring, Remove the cake ring from the cake. 2. Sift cocoa powder on top. Wipe away the cocoa powder at the side to give it a clean finishing. 3. 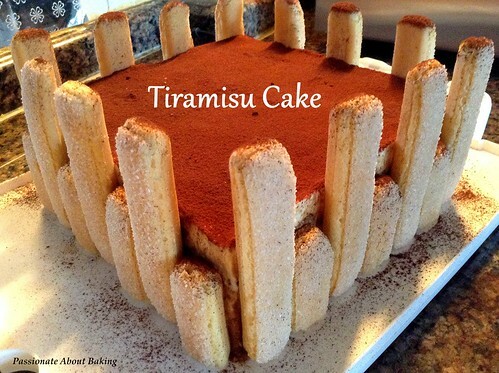 Use the sponge fingers to place it at the side of the cake. As I do not have sufficient, I cut some into half. Note: The Kahlua alcohol wasn't that strong after keeping it in the fridge for a day. As I am very sensitive to alcohol, I couldn't really taste the alcohol, which I really like. Therefore, it's good to make the day before you want to serve.